Move over Jo Malone, there’s a new sheriff in town! OK, Confession time – recently, I have found myself obsessing over candles. I know, I know.. how very Pinterest of me! Cliche’s aside, I love how aesthetically pleasing candles can add an instant dash of chic to an office desk or a touch of class to a coffee table and so on and so forth. Yes, I have turned into one of THOSE people – you know, the one’s who buy a bunch of candles and never light them. Today though, I want to focus on one particular brand, Maison Ves.. Launched earlier this year, Maison Ves successfully intertwined all the luxurious elements we’d expect from a candle brand with a modern touch – hashtags. Offering 8 different scents for 8 different occasions, each Maison Ves candle comes engraved with hashtags relating to the event. For example, some are more lighthearted with the Best Friend candle sporting not only a divine Black Fig & Vanilla scent but also tags such as #PARTNERINCRIME or the Engagement candle reffering to the event #GAMEOVER & #OFFTHEMARKET while emulating gorgeous scents of Lemongrass and Verbena. There’s also candles for Birthday’s, Weddings, Valentines Day, Thank You, Relax and of course, Mother’s Day. I adore the concept of adding hashtags.. we are the social media generation and I think Maison Ves hit the nail on the head with adding a modern touch to their luxurious candles. My mum is definitely getting one of these for Mother’s Day! You can shop the entire Maison Ves line here. So on the weekend, Matt and I found ourselves a stones throw away from New Bond Street on Woodstock Street, in a discreet but classy bar and restaurant called Gigi’s. Walking in, the first thing I noticed was the elegant decor.. the blue velvet booths, crystal chandeliers and marble table tops oozed class and decadence but a closer look revealed effortlessly stacked fashion and travel coffee table books tucked away in corners – a modern twist on a classic, much like Gigi’s offerings on it’s menu.. The first thing that arrived on our table was the bread basket which comprised of spicy breadsticks, Sardinian bread and two rolls, each flavoured with squid ink and green sage – delish! For my starter, I opted for the Cornish Seabass Tartare with avocado, orange and sea aster – the dish was beautifully presented with the combination of the orange mixed with the greens on the plate really jumped out at you, especially against the blue surface; felt like I was looking at the sea! It tasted even better than it looked, the flavours perfectly balanced and the avocado, sea aster & orange adding depth and texture to the fish. Matt went for the Roasted Octopus with Barlotti Beans in an Onion Broth which he absolutely loved! The octopus was cooked to perfection and seasoned beautifully, with the broth full of rich and intense flavor. For our next course, Matt and I decided to share a pasta dish that really stood out to us on the menu – Spaghetti cooked in Mantecato Squid juice served with Oscietra caviar and Gold, yes you read right, real gold. The pasta was delicious – the flavour of the squid was really intense and both the caviar and gold added texture to the dish. For our mains, I opted for the Miso marinated blackened Cod served with Kale and Sea Lettuce. The fish was absolutely divine.. it flaked to the touch and completely melted in your mouth. Matt went for the very manly option and chose the White Park fillet steak dusted with lemon and served with potatoes, black cabbage and yellow roots dressing… I actually didn’t get to try it as he was enjoying it so much he wouldn’t share – speaks volumes I guess! Haha. Even though we were both so full at this point, we’d seen other people eating their desserts and each plate that had come out looked so good we just couldn’t resist! I went for the Chocolate Mondrian which was just heavenly – moist chocolate sponge covered with a thin layer of milk chocolate with bars of caramel and white chocolate on top. Matt went for their signature Tiramisu which steps away from the heavy, stodgy classic and instead you are presented with a deconstructed version. Every element on Matt’s plate was absolutely delicious. Finally, after a pasta and chocolate overload, we had a latte to wash everything down and to give us that little bit of energy to get out of our exquisite food comas! Thank you to the amazing team at Gigi’s for having us! I would definitely go back again – the food was impeccable, the service faultless and it is perfectly located. As always, thanks for reading my loves.. until the next post! Good day my lovely Londonistas! I’d like to wish you both a happy Valentines day and more importantly, a happy start to London Fashion Week. I’d be lying if I said I’m fond of holidays like Valentine’s day.. don’t get me wrong I am all for celebrating the people we love and reminding them how much we care about them. 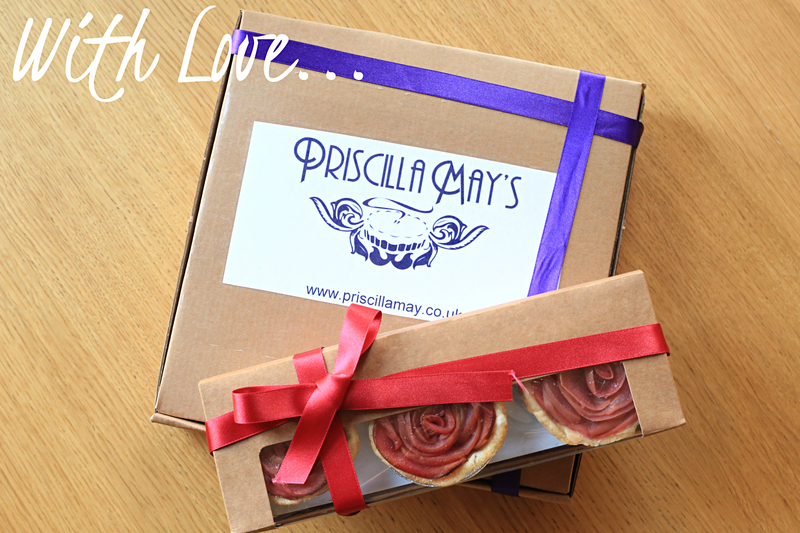 I just don’t think we need a particular day to do it..
What I am fond of, however, is good baking.. and in particular, delicious home-baked goodness from Priscilla May’s. Having heard about the launch of this venture, I had a quick glance at the menu and was blown away by the unique combination of flavours listed… Turkish delight? Burnt Orange Creme Brulee?? In a pie? Having thoroughly grabbed my attention, I sat down with owner Nina Singh for a quick chat and a DELISH sampling session. “Priscilla May was born out of two things, my love of baking and my love of my Nana. Priscilla May is actually my Grandmothers name. She was the most amazing Nana in the world and this is my tribute to her. Currently the most popular baking trends in the UK are not actually British at all, Cronuts, Macaroons, Whoopie Pies… are all American. So I decided to do something which can be just as versatile as a cupcake, maybe not as pretty but equally as a charming.. and quintessentially British – Pies”. And charming they certainly are.. 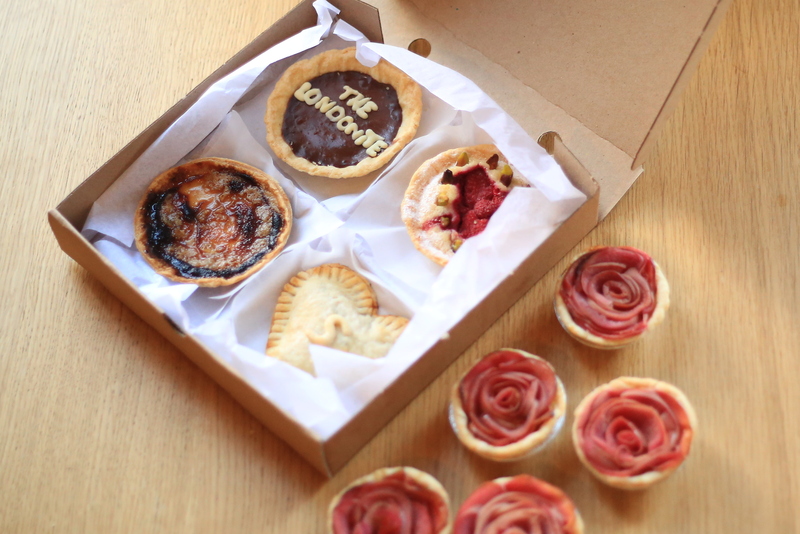 I loved everything about Priscilla May‘s pies.. you can see that each mini pie is made with love. Nina made sure to keep the classics on the menu; Apple, Cherry, Bakewell but mixes it up with a range of unique flavours on her menu..
My favorites were definitely the PB&C.. That’s a chocolate custard on a layer of peanut butter in a peanut pastry (TO DIE FOR) and the Blood Orange Creme Brulee, which is a vanilla creme with a crunchy blood orange brulee on top. One which definitely surprised me was the Turkish delight, not a flavour I’ve ever been fond of.. but the combination of fresh raspberries, pistachios and rose flavoured frangipan is truly out of this world. 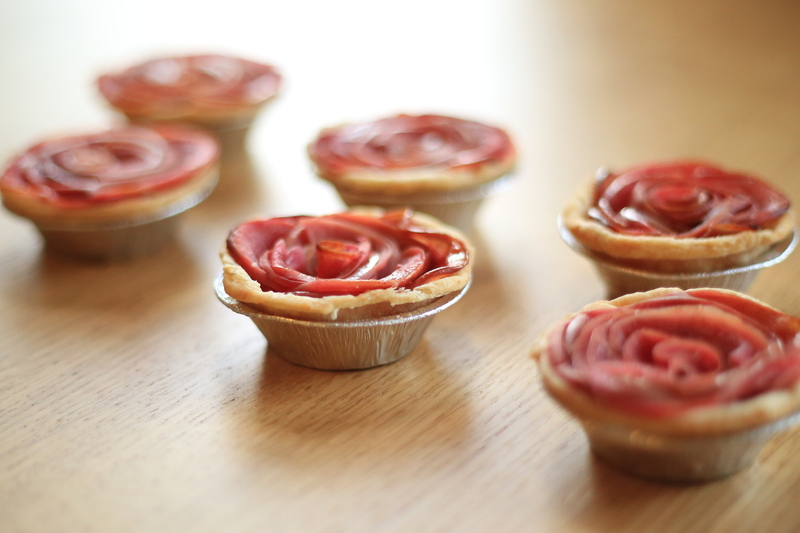 Another stand out item from the menu are the beautiful, hand crafted roses made from apples sat on a cinnamon custard base.. so yum. I couldn’t agree with Nina more.. beyond being absolutely delicious, I found Priscilla May pies to be a real conversation starter between The Londonite tasting team! We all had our opinions on what flavours worked and what reminded us of our childhoods and brought back cherished memories! 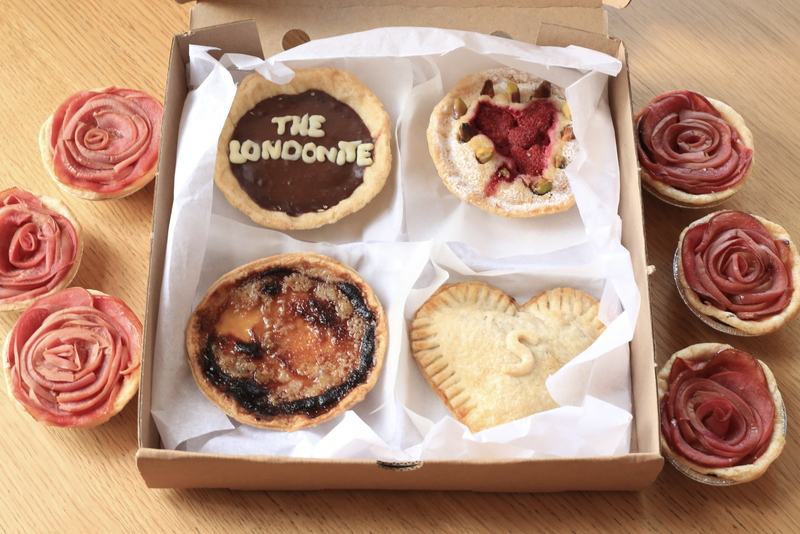 Be sure to check out the menu and treat yourself or your loved ones to some divine tasting mini-pies!